I am a retired Plumber and HVACR technician. I have a modest workshop with a Milling Machine, a Lathe, Drill press, Table Saw and Radial Arm Saw. I usually use those things in an effort, often futile, to repair things. So I make many small parts, if the part is too complex to keep it in my head, I’ll free-hand draw up whatever I want to make, I also make a rather inept use of SketchUp©. I have taught Apprentices how to draw Plumbing isometrics, a type of drawing that does not use perspective and where unit length is always the same. For instance; draw a skeletal cube so that you can see all twelve lines that make up the edges of the cube, all lines of the cube are the same unit length. Once you get to the stage where you can see the cube morph “in” and “out” of the page, you are ready to learn to draw Plumbing Isometrics. So far as I know there is no on-line resource for this type of drawing. I have managed to learn to use SketchUp© well enough to meet my needs for drawing small parts, but my, the stuff I see out there that purports to be done with SketchUp©, those drawings are well beyond my abilities. I should mention in this context that I have never used SketchUp© enough to justify purchasing the Pro version, that may well make a difference. 1) What can you do at the Internet Relay Chat Network? 2) Why is a separate registration for LibreOffice© and LibreCAD© needed? 3) There does not seem to be a sub-forum for new folk. 4) There doesn’t seem to be a post of forum rules, not even; Now play nice people. 5) If there is moderation, it’s not evident to me. 6) how does one remove / delete / cut entities.? Well Okay, I did figure this out after much trial and error, however, I couldn’t find a reference to this function in the on-line manual. Of the few question headings in the forum that I’ve scanned, I don’t, so far, understand enough to have a very good idea of what the question pertains to. I have tried to follow the on-line manual but I often can’t get anything to happen or things happen, but I don’t know what I did to produce the effect. Regretfully, I don’t have the knowledge or experience to frame more specific questions. For instance; I learned how to draw a box, but for the life of me cannot get the program / App to allow me to draw a second box on top. I imagine this is a very simple action, I can’t now make it happen. Except for the name similarity (Libre) there is no relation between the two projects. you can just ask your question in the appropriate forum, we at LibreCAD don’t feel there is a need for a seperate forum for new users. Most people have a technical background and can ask the right question in the right forum. We all agree that we know how to be nice and ask a question smartly, so far we don’t have a lot of issue on the forum except for spam. We do moderate but it’s 99.99% spam and we just delete the post and block the person. There are some tutorials on youtube aswell.. It’s perhaps a bit awkward, but one can get used to it quickly. Perhaps some other people can help out answering on the below questions. Hi Librecadni10 and welcome to the forum. As stated in other posts there is no connection between LibreOffice and LibreCAD beyond the Libre. Libre is the spanish word for ¨free.¨ So I suppose it could be translated to FreeOffice and FreeCAD. I understand how frustrating learning something new can be. It is difficult to frame a proper question when you don´t know diddly squat about the subject. My advice to you is to ask only one question in each post. This makes it easier for the members of the forum to answer and easier for you to follow. Don´t worry about the technical terms; just state as clearly as you can what you want to accomplish, i.e. How to I draw one box on top of another? From that point others may ask you for more detail. This is where you will learn the correct phraseology. Keep asking questions and you will be a PFG (Pure Freaking Genius) in no time! Now I will ask you a couple of questions. Do you mean two square or rectangular objects stacked one on top of the other? Or, do you mean a 3D (isometric) view of a box? This screenshot shows what I´m talking about. What I was attempting was to stack one box on top of another, the difference was that I was trying to start the second, smaller, box from one of the corners of the first box. I was trying to learn if the line segment between the adjacent boxes could be deleted. My current drawing projects are a Rule stop and a Drill bit sharpener jig. The Rule stop is just a small vice or clamp intended to grip the sides of the rule and act as a way to make repeat measurements. If you have ever used what's known as a combination square and set the rule to a given measurement you have used the combination square as a rule stop. Looking down the long axis of the rule, the Rule stop would look somewhat like a flat shallow squared off U. If you are familiar with stock metal shapes, what known's as a channel iron approximates the desired shape much more closely. So, this can be conceptualized as two small boxes stacked on top of a relatively long and shallow box. So, I drew a box. And then tried to draw another. I wasn't able to start the second box at all. I would select the line icon and then the rectangle icon, no matter where I tried to start the second rectangle nothing happened. I've got other projects, so many other projects! 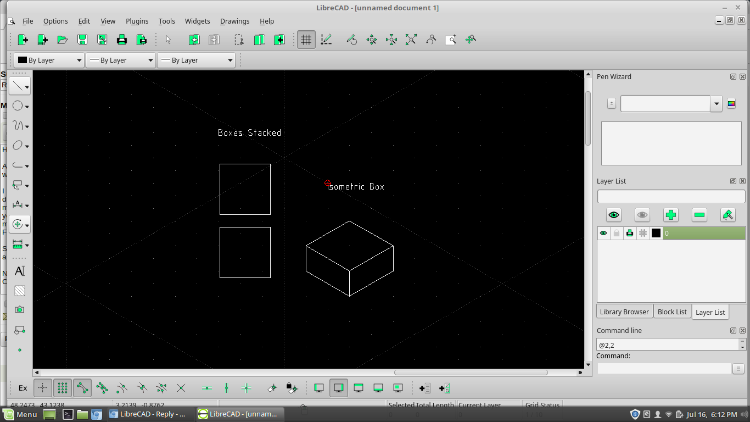 So I haven't spent much time on LibreCAD, not nearly enough to be familiar with even a few of the various features. I do recognize that LibreCAD will require a significant time investment. [It took me at least two years of on and off use to acquire a small degree of ability with SketchUP.] However I only have so much patience when things don't seem to work like they should, and I don't understand why not. It could well be that I inadvertently changed some setting. I'll start another drawing and see what happens. However other things are needing my attention and I must attend to those. Well, I should apologize for babbling on, your time is valuable and using some of it to try to help me is a great gift and much appreciated. Note: It's highly likely there are typo's and misspellings I didn't find, I hope these do not change the sense of what I'm trying to say too much. No need for apologies at all. I tend to babble myself at times. Also, I don't think the grammar police patrol this forum so don't fret about that kinda stuff. I do quite a bit of fabrication so I use various measuring tools such as combination squares, calipers, micrometers and so on on a regular basis. And I'm pretty familiar with most of the basic metal shapes. Flats, angles, square tubes, etc. I am not a machinist but I do use a CNC milling machine and a manual lathe occasionally. I should be able to grasp the concept of what you are trying to accomplish. LibreCAD is extremely easy to use and will not take you anywhere near two years to learn. Seeing as how you own a milling machine I assume that you understand the X-Y-Z (Cartesian) system. But do you understand the differences between absolute, relative and polar coordinates? If you have a firm grasp of these it is very simple to create an object of an exact size and an exact location. If not, Google them. As for your Rule Stop. In the screenshot below I have created a drawing of what I think you want. The sizes are arbitrary. Is this close? As for your attempt to draw a second box, you stated, "So, I drew a box. And then tried to draw another. I wasn't able to start the second box at all. I would select the line icon and then the rectangle icon, no matter where I tried to start the second rectangle nothing happened. ."
Using the rectangle command is pretty straightforward. You are asked to supply a starting and ending point. You have a few options as to how you specify those points. The most accurate is to specify an absolute location. For example 5,8 entered inot the command line would translate to, "Start at location x=5 and y=8. The numbers 5 and 8 are in the units of measure (inches, millimeters, feet) you have specified. Or @3,1. The @ means a relative location. This would be relative to the last location entered. In our example the last location could be 5,8 so the relative location would add 3 to the x coordinate and 1 to the y. The end result would be the absolute location of x=8 and y=9. Another way is to use snaps. The image above shows the various snap points you can use. You can turn on one or more of these snaps at any given time. I have numbered them (the second 6 should be 7) to explain them. 1 - Free Snap. Snap anywhere. 2 - Snap on Grid - Snap on a grid point if the grid is visible. 3 - Endpoint - Snap on the endpoint of a line. 4 - Snap on entity - Snaps anywhere on an entity. 5 - Snap center - Snaps to the center of a circle or arc. 6 - (#2) Snap Distance - Another useful snap. Again there is a box at the top of the screen where you can enter a distance. This distance is the distance from the closest end point. 8 - Snap intersection. Where two lines cross. Try this. Select the rectangle tool. For the starting corner enter 0,0 in the command line. For the second corner enter 1,1. This will give you a square 1 unit wide by 1 unit tall. Then select the rectangle tool again. Enter 0,1.5 for the first corner and 1,2.5. This should give you another square .5 unit above the first. Thank you for the reply, It's always a struggle to know just how much to explain to a person, too little and they will lack the need background, too much and you lose the person in jargon. Your drawing is close, for a Rule stop you want to clamp the widest edge of the rule. If you widen the the distance between the uprights to something just greater than 1" (US customary) / 26mm. [1" = 25.4 exact by US Federal law. ], and then shorten the uprights to the appropriate height, you would have it. The four 1" wide combination square rules I have vary from 0.090" to 0.095" thick, so ~2.29mm to ~2.41mm. I would make the uprights no more than 0.100 / 3mm tall. The clamping screw would screw into one of the uprights and clamp the rule against the other one. The Starrett clamp I linked to doesn't suit the use I have in mind. I bought this https://www.amazon.com/Ruler-Machinist-Anodized-Taytools-110211r/dp/B07DYXNLWB/ref=sr_1_126?ie=UTF8&qid=1532034461&sr=8-126&keywords=taytools only to find that the linked Rule stop only accoumadeted rules that were 0.050" / ~ 1mm thick. And while I was writing this I've had yet another idea as to how to accomplish the desired goal. I'm going to see what I can accomplish and do more reading. To unsubscribe from Librecadni10, brief self-introduction, click here. What I did: I freehanded an elevation view of my Rule stop, I located every corner by it's absolute coordinates. I "commanded" a point, and from there on it was just a matter of specifying start and end points of lines. 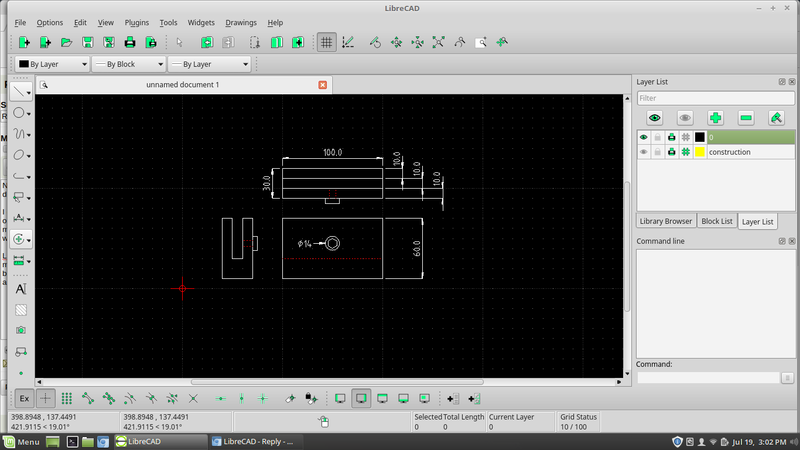 Do not be fooled, it took multiple attempts to get things correct, but at least I've made my first LibreCAD drawing. Alas, it would seem that screen capture isn't working on this computer, otherwise you can be sure I would be including a picture. I think it's most likely I'll be concentrating on learning the command line as thoroughly as I can. Thank you for the encouragement, I was pretty frustrated, glad I didn't give up. Great! It really will become much easier as you learn more. Creating objects using the command line gives an extremely accurate drawing. But, don't give up on using snaps either. In my earlier post I gave you a screen shot of the snap icons located at the bottom of the screen. (I'm assuming you are using the latest release of LibreCAD. I am using 2,2,0-rc1 on Linux Mint.) The snaps will "lock on" to a particular point on the drawing. This point can vary depending on the type of snap you have turned on. You can turn on more than one at a time. Using snaps can save a bunch of time in calculating the absolute points. Total control is obtained by using a combination of absolute, relative, polar and snaps. "Alas, it would seem that screen capture isn't working on this computer,..."
If you are using Windows the screen capture saves the screen capture to memory. Open Paint and hit CTRL-V to paste the image to the screen. Then save the image. If on Windows 10, use the snipping tool. I'm reading through the manual again. I think I'll be starting separate threads from here on out.